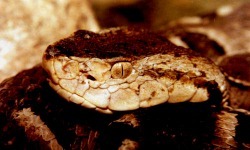 The Jararaca Pit Viper reproduces by keeping eggs inside the mother's body until they are ready to hatch. This is also known as ovoviviparity. They are believed to produce about 20 young at a time.